All About You: What to do when your children face problems. Join us at our weekly women's seminars, every Sunday 5pm - at the Rainbow Theatre, London, N4 3NX. What to do when your children face problems. One of the most difficult things we mothers have to face is witnessing our children go through a hard time. Our maternal instincts kick in and we want to spare and protect them. But, unfortunately, difficulties come to everyone. 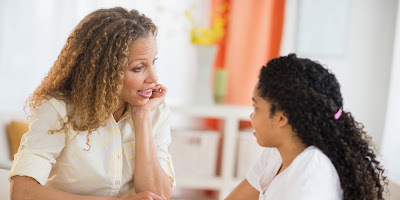 So, how can you as a mother deal with your children's problems? Ruling out indifference, we find that there are two ways we mothers can react when our children face problems - we can either feel sorrow or compassion towards them. What is the difference? Sorrow is a feeling of deep distress caused by misfortune, and compassion is a feeling of deep sympathy for another who is stricken by misfortune, accompanied by a strong desire to alleviate the suffering. What makes them different is sorrow is just a feeling, but compassion makes you want to take action against the problem. a word. What should you do when you detect a problem? Times like these call for action. First of all, you should remain objective to understand what their problem is, without allowing your feelings to cloud your judgment. Practicing the communication skills we taught you will come in handy, should you need to have a conversation with your child about what's going on. Once you've identified the problem fully, the next step is to figure out how you can help your child, without taking over. Remember, you still want to teach them to be independent, so you don't want to solve problems for them, but guide them to solve their own problems under your careful watch. There are situations in which you'll be able to help, guide or support them, but there are others in which you will not be abel to do anything about their problem. In cases like these, you can help them through your prayers and being next to them. And is this act of faith and love that the mothers are putting in practice this week, we are going to do something to help our children instead of lamenting. We invite you to join us this Sunday after the 10:00am service to learn a new revelation. We strongly believe in the old saying, that prevention is better than cure. Given the right tools, we can avoid making costly mistakes in our relationships, health, beauty and spiritual well-being. We are here to provide you with those tools. We are women who once struggled with and overcame rejection, betrayal, depression, panic attacks, complexes, insecurities and many of these things that make us feel inadequate as women, and cause us to draw back. We can't undo our past, but we can take advantage of the lessons it has taught us to avoid future mistakes and to help other women do the same. We hold friendly, light-hearted meetings every Sunday 5pm, which equip women with the tools they need to recover and retain control over every area of their lives. Because we know that there is no one who understands a woman better than another woman, we have one-to-one sessions where you can speak confidentially to one of our mentors. You can find our branch nearest to you by calling our 24H Helpline, on 020 7686-6000 or emailing rahab@uckg.org. Let us take care of you! The diary of an ex-sufferer - the beginning. Is it good to feel pain? It is not enough to be a good person. Understand your value as a woman. What to do when you fall. How to discipline your children. A sign of true strength. Are your dreams real or just a fantasy?